Tombola Bingo is a household name when it comes to online bingo, this award winning site is for us the number 1 site in the UK. The extremely busy and popular site has it all, from load of low priced tickets, to tonnes of promotions. What makes Tombola the bets is the bingo community it has, the game hosts and fellow players make the whole experience that little bit more fun! Playing bingo at Tombola is a must! 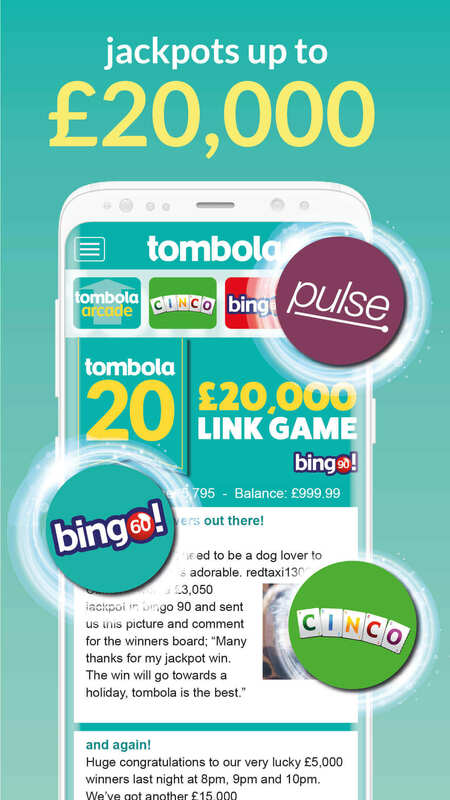 Tombola has been on the online bingo scene since the summer of 2007, and while it might be more than a decade old, it’s as innovative in its games and special offers as ever. Tombola is, and remains a family-run company, and it aims to offer UK bingo fans something that everyone can enjoy. Ticket prices are as low as 2p and the prizes that are up for grabs can be worth as much as £20,000. The company is based in Sunderland; hence the majority of the friendly and witty chat moderators are from the North East of England too. What makes this particular site so special is that it’s completely unique and, therefore, runs no networked jackpot games where you can often be outnumbered by other players. Even if you’re not logged in, you can see at a glance how many members are online. Judging by the average figures (N.B. 5,500+ at the time of our last visit on a Saturday lunchtime), the site is positively thriving. Multiple awards act as a testament to the brand’s success, including Best Bingo Operator (EGR Awards 2017 and 2018). The homepage shows you the latest promotions along with some of the exclusive games that you can enjoy as a Tombola member such as Pulse, Cinco, Lucky 7, and Hamster Race. If you prefer more traditional bingo games, that’s fine too as Tombola also boasts 90-ball, 80-ball, and 75-ball games. If you’re wondering whether the prizes are worth playing for, you can rest easy (or dance with excitement if you prefer) as an average of £7m is won every week. The brand’s social media pages (e.g. Facebook, Instagram, and Twitter) are extremely active, and help you to integrate further into the community. In addition, you’ll be able to keep up with the latest site news and take part in Facebook-exclusive competitions. Tombola is licensed and regulated by both the UK Gambling Commission and the Government of Gibraltar, and it’s also GamCare-certified. There are many reasons to join Tombola, but one of the most exciting is the £5 free bonus that you can claim when you register an account. No deposit is necessary and neither do you need to provide any debit or credit card details. While you cannot withdraw the bonus itself, any winnings that result from it are yours to keep. If you then decide that you’d like to play with your own funds, Tombola offers a 200% welcome bonus. 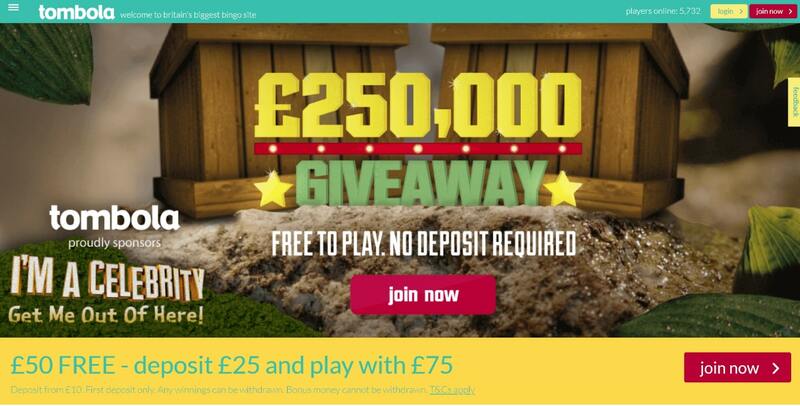 You can claim it by making a first deposit of at least £10, and the maximum bonus that you can qualify for is £50. Although Tombola Bingo doesn’t currently operate a loyalty programme, you can obtain rewards by inviting your pals to join you at the site. The Playmates scheme allows you to send your friends £5 of bonus funds to try Tombola out with, and if they sign up and deposit £20, you also gain a £20 bingo bonus. It’s a win-win situation! You can continue playing your favourite bingo games at Tombola when you leave home by downloading the Tombola mobile app for iOs, Android or Kindle devices. The mobile apps give you access to all of the site’s exclusive bingo rooms, as well as the free Stars game. You can also make withdrawals and deposits on the move, and participate in chat games for the chance to win additional prizes. When it comes to unique online bingo variants, Tombola is hard to beat. The options are listed vertically down the left-hand side of the homepage, and they include Cinco, Pulse, Pirates, Blocks, Rollercoaster (N.B., fill your carriage with falling bingo balls to gain a cash prize), and Lucky 7 (N.B., simply match seven symbols to win), as well as 50, 60, 75, 80 and 90-ball rooms. Pulse is a futuristic type of bingo game that costs as little as 10p per ticket. Rather than using a typical bingo card, the number balls float around the screen, and as you match the numbers that are called out, the respective balls burst and disappear. Cinco is a card-based game with £20,000 jackpots, and games start from just 5p. There are casino-style games on offer too, including Bingo Roulette, Hamster Race, and Tombola Roulette. The site also boasts an area called Arcade which features unique titles like Emoji, Scratch, Go, and Glow, Spin, Pick, Bubble. Stars is the name of the weekly free game that lets you play for a share of £30,000. The Tombola customer service team operates 24/7, and you can get in touch by live help, telephone (N.B., free from within the UK via an 0800 number) or email. The Help area of the website contains a Getting Started guide, as well as FAQ on topics such as fair play, responsible gambling, technical issues, and banking. You can choose to fund your Tombola account or withdraw your winnings using Visa, Visa Debit, Maestro, MasterCard or Paypal. The minimum and maximum deposit amounts are £10 and £500 respectively, and you can change your daily, weekly, and monthly deposit limits if you wish. You can cash out £10 or more per transaction, and withdrawal processing times are three to five working days for debit/credit card and up to 72 hours for Paypal. If you wish to withdraw £20,000 or more, you can only do so via cheque. So, does Tombola back up its claims to be “Britain’s biggest bingo site”? Well, in our opinion, it does. It has thousands of members, an impressive array of unique bingo games and arcade games, and massive prize pools. We also love that the mobile app offers just an exciting playing experience as the desktop site. If you’re looking for an online bingo site that’s unique, super-friendly, ready to help its customers around-the-clock, and offers a variety of innovative games that can be played for as little as 2p, make a beeline for Tombola!